Click image to view full newsletter. I trust this finds you enjoying the weather and doing a bit of sketching. It’s hot in my corner of the Mountain West. I’m writing you from my basement – the only space where it is cool enough to think. But, happily, along with the heat comes garden season, complete with loads of the pollinators I so love to watch and draw. Speaking of which, this is my third year gardening at 7,200 feet above sea level, and it’s a garden in a new part of town. On top of moving, there are other reasons why it was a busy spring. I successfullydefended my master’s thesis and started a new job. I published a blog series about using the internet to source images for SciComm. I’ve also been co-editing a blog featuring the wide range of career paths possible in SciComm. And, I did some traveling and teaching about art-science synergy, collaborate on communicating about migration, and more. Also,CommNatural is on Instagram now! As a result of my transition to a new job and all this other busyness, I’m shifting this newsletter from monthly to quarterly. That will ensure I can still connect with you, and share ideas and field experiences, while also giving attention to this new work. Meanwhile, I’ll be posting material on the blog more frequently. I will reference some of it in the newsletter each quarter. If you’d like to keep up as material is published, and don’t want to miss any of it, please subscribe to my blog. Just visit the website, scroll to the bottom, and provide your email address in the subscription bar! Thanks in advance for subscribing there. As always, feel free to share* this newsletter with your friends & colleagues. And do share your sketches & SciArt adventures with me via email or social media! The longer I am involved with art-science integration, the more time I get to spend teaching teachers — teaching them how to use drawing in science education. It’s an incredible perk of the work I do, as I’ve written about before. 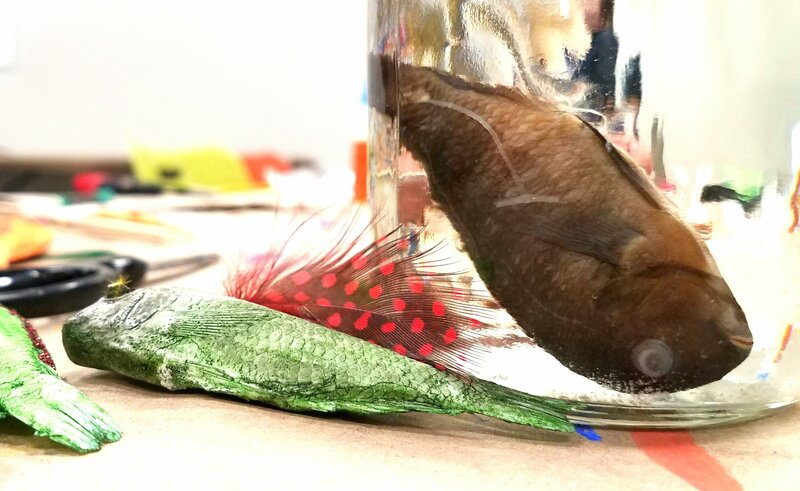 In June, I co-taught a Summer Teaching Institute focused on “Exploring Art & Science.” The institute was organized by the University of Wyoming Art Museum’s Education Curator Katie Christensen, along with Master Teacher Heather Bender, and Artmobile Coordinator Erica Ramsey. Together, they and the rest of the Art Museum team are great advocates and partners for art-science work on campus and beyond. During the institute, my teaching focus was drawing-based science learning and assessment strategies. We started with basic drawing techniques. I walked participants through a toolkit development session which involved lots of practice drawing. Reproducible methods (and results) are a key part of rigorous science. And reproducing art has been part of doing art for centuries. I spent much of the summer contributing to/planning two summer teaching institutes at the University of Wyoming, working on an art-as-science research manuscript with some great collaborators in Canada’s Northwest Territories, and crafting some illustrations of native bees for a science ed/outreach initiative based in North Carolina. And most recently, I helped facilitate UW’s first ever SciArt Symposium, which was a fascinating blend of both fields. Through it all, I’ve been thinking about my genuine interest in being a catalyst and idea-sharer, helping others access the pleasure and productive aspects of art-science integration. And so, this month’s newsletter focuses on some of the ideas and info I’ve encountered and shared this summer, with an eye toward connecting you to others’ ideas. Bee Germs illustrations are live! I don’t usually post selfies, but that’s about to change. OR, some things #scientistswhoselfie and #sketchyourscience have in common. Communicate better. Get my eco-comm tips by email. All rights reserved, Bethann Garramon Merkle.